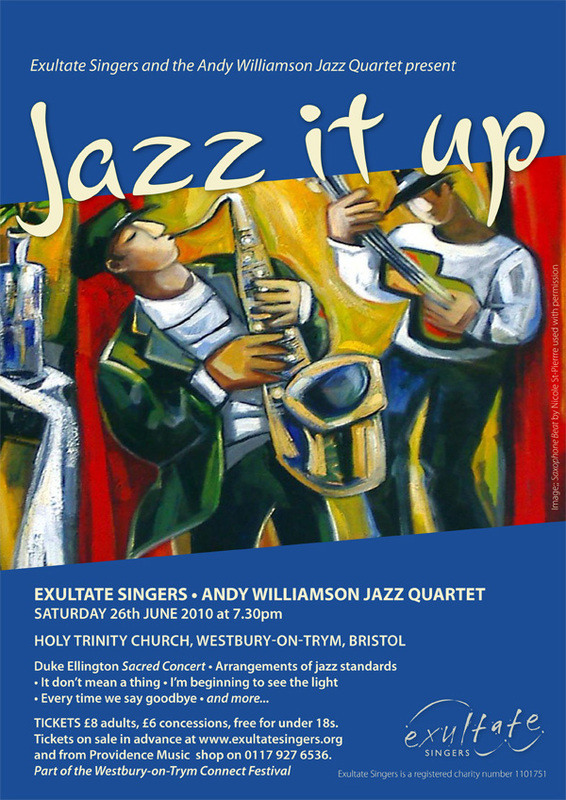 Exultate Singers and Andy Williamson’s fantastic 4-piece jazz band perform Duke Ellington’s Sacred Concert and a programme of jazz standards - a toe-tapping evening is in store. Duke Ellington’s Sacred Concert is a suite of pieces for choir and jazz band - ranging from the exuberant and energetic in large choruses to serene and sensuous in quieter, more intimate sections. The singers have performed Sacred Concert live on BBC Radio 4 and in a sell-out concert in Bristol in 2004. The concert is given as part of the Churches Together in the Westbury Area Connect Festival 2010. Tickets are �£8 for adults, �£6 for concessions, free for under 18s. 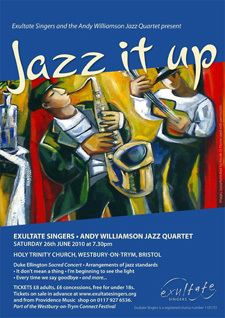 Friends of Exultate Singers receive a 25% discount on ticket prices.